Meet the farmers and food producers of Hawaii's diversified agricultural scene. Select from a wide variety of fruits, vegetables, flowers, beef, aqua cultured seafood, fresh baked breads, hand made pastas, tropical jams and jellies, unique snack foods, honey, baked goods, specialty seasonings and more. A variety of vendors display and sell their products each week. 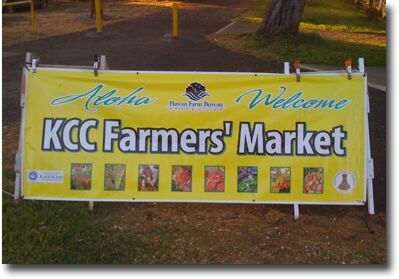 NOTE: KCC Tuesday Farmers' Market will be open on Christmas Eve December 24, 2013 for those last minute shoppers and New Years Eve December 31, 2013 for local produce. Kapiolani Community College, 4303 Diamond Head Road. Catch #3, 22, or 58 on TheBus. Meet the farmers and food producers of Hawaii's diversified agricultural scene. Select from a wide variety of fruits, vegetables, flowers, beef, aqua cultured seafood, fresh baked breads, hand made pastas, tropical jams and jellies, unique snack foods, honey, baked goods, specialty seasonings and more. More than 2 dozen vendors display and sell their products each week. Saturdays, 7:30 to 11:00 a.m. at Kapiolani Community College, 4303 Diamond Head Road. Catch #3, 22, or 58 on TheBus. Organized since 1948, the HFBF, a nonprofit organization, is comprised of 1,800 farm family members statewide, and serves as Hawai`i's voice of agriculture to protect, advocate and advance the social, economic and educational interest of our diverse agricultural community. 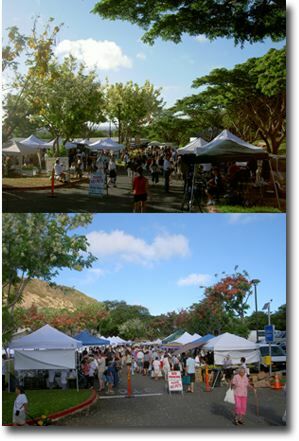 The HFBF is the owner-operator of four O`ahu Farmers' Markets, with the principal goal of supporting agriculture in Hawaii by providing a venue for farmers in the state. In addition to the Kapi'olani CC three-month Pilot Tuesday and Saturday Market, the other locations include: Mililani High School on Sundays; Neal Blaisdell Center on Wednesdays; and Kailua Town Center on Thursdays. The HFBF's Farmers' Markets support the general operations of the HFBF. Give it Fresh Today is a produce donation project. We started officially on 1/2/2010 and have had an amazing response from the public. In our first weeks we have collected over 400 pounds of food for the Institute of Human Services and Unity Church of Hawaii. We collect produce donations from the shoppers at the Hawaii Farm Bureau Federation's Kapiolani Community College farmer's market on Saturdays between 7:30-11:00am and distribute the locally grown food to organizations that help to feed those in our community who are less fortunate and have fewer choices about what they eat. People shopping at the farmer's market are already making an effort to support local agriculture with their purchases because it is aligned with their environmental or health values. This project gives the shoppers an opportunity to support the farms that they love, while supporting organizations that help to feed the hungry with healthier meal choices. We get to support these organizations by offering healthy, locally-grown food. It helps keep more money flowing through our local economy. Extra home-grown produce is also gladly accepted, and our donation table provides a weekly drop-off point for people with extra produce growing in their yards. Many food drive programs make requests for canned goods and non-perishables. This program is asking for fresh fruits and vegetables that will contribute to the health and wellness of the people receiving the donations. It also supports local agriculture in the process. Some of the vendors at the farmer's market have made donations, but that was never the intended focus of the program. We want to support the farmers in providing valuable fresh foods to our community. If the farmers want to make donations at the end of the market, they have been welcome to do so. The farmers and vendors are supporting us by displaying signs in their booths. Preserving lands for agricultural use is important for so many different reasons. At a time when we're more concerned about our use of fossil fuels, and more people are choosing to "eat locally," it just makes sense that we should try to feed the less fortunate on our island with food that doesn't have to be imported, keeps money in the local economy, AND is more nutritious. Donations have included everything from bananas and tomatoes, to okra and breadfruit. We're also accepting monetary donations and would love for volunteers to come and support our ongoing efforts by donating and collecting food on Saturdays. We have 2 shifts 7:30-9:30am and 9:30-11:30am. 1. Collect produce donations and give a "Thank You" flyer to each person that donates. 2. If anyone would like to have their donation recorded for tax purposes, have them fill in their information on a form. 3. Collect information from folks who would like to volunteer/help out. 4. Help to organize produce donations and load them into trucks at the end of the market. 3 people will be scheduled per shift, so that volunteers can do their own personal shopping during the shift that they choose! Vivian, a gifted educator at Kahala Elementary School, is a passionate advocate for sustainability and local agriculture. 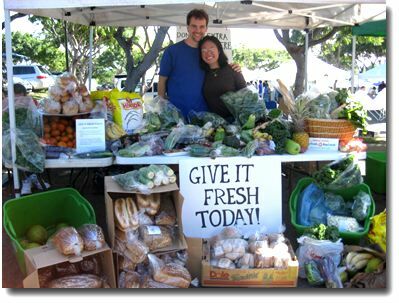 She founded "Give It Fresh Today" (G.I.F.T) at the farmer's market at Kapiolani Community College to provide an opportunity for weekly shoppers and home gardeners with a convenient way to donate locally grown fruits and vegetables to those in need. Recognized by Pacific Business News as one of Hawai'i's "40 Under 40," and the Honolulu Star Advertiser as one of "10 Who Made a Difference" in 2010, she enriches the lives of children with service learning and origami, is a practitioner of the Feldenkrais Method, and enjoys swing dance. Give It Fresh: Donate local produce here to share with shelter programs. Time: 7:30 a.m. to 11:00 a.m.